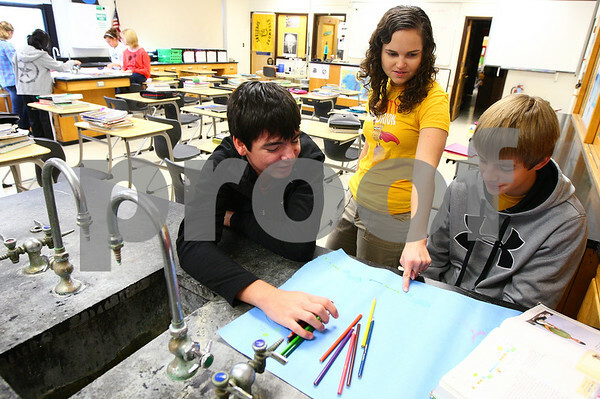 Sarah Eckert, a first-year biology teacher at Sycamore High School, talks to sophomores Brad O'Connor (left) and Michael Koeplin (right) about their drawings of different types of energy on Friday, Oct. 21, 2011. Eckert is part of a teacher mentoring program where she is paired with experienced teacher Scott Horlock. One of the teaching schemes discussed in the mentoring program is called 'Creating Independence through Student-owned Strategies' or C.R.I.S.S., the student drawing activity falls under this scheme.